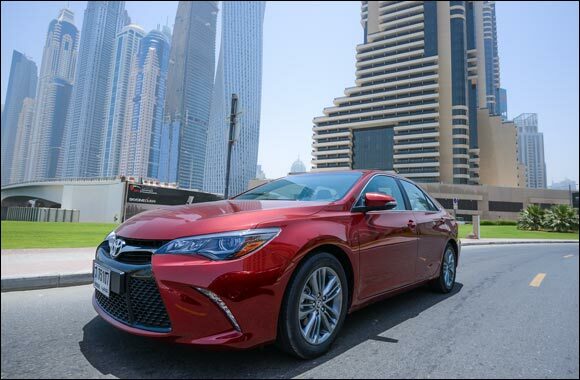 Dubai, United Arab Emirates, June 8th, 2015 – Al-Futtaim Motors, exclusive distributor of Toyota in the UAE, has launched the newest generation 2016 Camry, the boldest ever engineered, and the world’s bestselling mid-size sedan. Traditionally a staple of the United Arab Emirates’ everyday life, the new Camry comes with a bumper-to-bumper redesign, more refined and aggressive exterior styling, as well as a more luxurious interior, while retaining the car’s legendary quality, durability and reliability, as well as its class-leading safety features and low total cost of ownership. Developed for customers who desire a car with more emotional styling and a greater driving enjoyment, the Bold New Camry features expressive style and luxury with the new front grille and the overall exterior dress up, while the new sophisticated interior thrills the driver at first sight, thanks to a host of additional premium touches. With its 2.5 L engine producing 181 horsepower, the new Camry delivers class-top engine performance, while the responsive handling and heightened comfort were realized by a more dynamic suspension. An expanded suite of equipment has been adopted not only to add convenience and sophistication but also to provide the driver with additional safety measures. “Sixty years ago, Al-Futtaim Motors started its journey to become the country’s leading automobile distributor. Twenty three years ago, we redefined the mobility industry by bringing the Toyota Camry to the UAE, paving the way for what would become one of the key players in “Moving the Nation”, our motto for the company’s 60th anniversary,” said Jon Williams, Managing Director at Al-Futtaim Motors. Since its global launch in 1982, Camry has exceeded the 15,000,000 million mark for models sold worldwide. In the UAE, since the car’s introduction in 1992, Al-Futtaim Motors has sold more than 150,000 Toyota Camrys, a testament to the evergreen popularity and trust that people have in the marque. “What we have done with this latest launch is challenged ourselves to deliver a product that transcends the segment, not only in terms of features offered, but also from a range and price proposition point of view. Coupled with the car’s legendary quality, durability and reliability, as well as the lowest total cost of ownership, the Bold New Camry will retain its leading position in the mid-size sedan segment,” added Williams. An aggressive looking front bumper and grille and pronounced side character lines give the new Camry a far more expressive style. The new Toyota Camry offers LED low and high beams, and LED DRLs integrated for an elegant appearance. Tail lamps wrap around into the tapered rear quarters for a more sophisticated look. The new Camry has an interior that thrills before the driver even starts moving. With its intuitive top-flight technology and high-contrast stitching, the cabin feels more like a cockpit than anything else, and the driver-focused layout is designed to reduce distraction. A sleek center stack with 4.2-inch TFT screen makes it easy to access content with an information layout which is simple and easy to understand. Suede perforated-trimmed door panels and contrast stitched finishes are situated throughout the cabin. The front seatback height and the cushion shape have been modified, increasing the surface area that contacts the body, resulting in comfortable and anti-fatigue seats. The rear seats split and fold forward so passengers can carry more luggage. Extensive real world road testing to fine-tune cabin noise levels has resulted in the creation of the quietest-ever Camry. The new cabin allows those inside to hold a conversation and enjoy an unmatched level of quietness that stands out in its class. A high performance yet compact, lightweight and fuel efficient air conditioning system has been adopted to deliver class-top cooling and comfort while being environmentally friendly. The independent left/right temperature controls allow separate temperature zones to be automatically set for the driver and front passenger seats. Adding to the class-leading comfort and utility quotient of the new Camry is the availability of a 10-speaker JBL surround system, which provides top class audio experience. The new Toyota Camry comes in 12 colors, including four new colors - Dark Blue, Dark Steel, Super White and Light Yellow and four interior colors – Ivory, Gray, Black, Gray & Black. The new Camry features a 2.5 liter four-cylinder engine that produces 181 horsepower and 235 NM of torque. A 6-speed automatic transmission enables smooth manual-like shift feeling and is complemented by an innovative flex-start control that proactively engages the lock-up clutch when starting off to enhance power transfer efficiency and lower the engine speed, contributing to excellent fuel economy. The newly developed Electric Power Steering (EPS) on all the new Toyota Camry models is tuned for better on-center feel, enhanced stability and agility. The use of efficient, lightweight and low-emission technologies has helped reduce kerb weight while ensuring high performance across the entire rev range. A preload differential that provides torque to limit the differential motion under light loads or low rotational speed differences helps the car realize excellent starting off performance and straight line stability. The improved suspension and steering systems along with optimized aerodynamics take the new Toyota Camry’s handling to a whole new level of responsiveness. The Bold New Camry continues Toyota’s comprehensive approach to safety to ensure peace of mind for customers. The car now comes with 10 airbags on the SE+ and Limited variant, which together with the enhanced Vehicle Stability Control, Anti-lock Brake System (ABS), Electronic Brake-force Distribution (EBD), Brake Assist (BA), ISO Fix Child Safety and a host of other features, that further enhance the safety standards of the car. These enhanced safety features have contributed to the new Camry earning a 5 Star Australian NCAP rating. The new Camry also employs an advanced collision safety technology designed to not only ensure occupant safety but also to reduce pedestrian injuries. In addition, the car enjoys a suite of convenience equipment that includes Rear View Monitor with Static Guide Lines in the Camry SE, coupled with rear parking sensors which detect obstacles behind the vehicle and inform the driver of the distance between the sensors and the obstacle using a buzzer. The Bold New Camry is now accessible to a larger customer base, offering the best value for money proposition through a greater line-up which consists of four different grades. Priced only at AED 83,900, the new Camry S offers valuable features, traditionally only available on higher grades, such as Keyless Entry, Steering Wheel Audio Control, Cruise Control and Bluetooth to name just a few. SE is priced at AED 87,900 and comes with Smart Entry/push Start Button, Rear Spoiler, 17” alloy wheels, Dual Exhaust, Powered Back Sunshade and Reverse Camera and more. For those looking for more sophistication, SE+ is offered at AED 95,900 and comes with race-inspired Paddle Shifts that put the power at the driver’s fingertips, Sunroof, Folding Mirrors, 4.2’’ TFT Display Unit, LED headlamps, Vehicle Stability Control (VSC) and ten airbags. As for the Camry Limited, the driver can enjoy a raft of exclusive features in the form of Navigation Display, 10 Speakers with JBL 7’’ Audio Display, navigation, Passenger Powered Seats, in addition to all the amenities featured in the SE+ model for only AED 105,900. The Bold New Camry is immediately available from June 8th at all Toyota showrooms in the UAE.